Queens Real Estate Market Report March 2019, courtesy of the Queens Home Team at Keller Williams Realty Landmark II. Looking for a real estate agent in Queens NY? Let the Queens Home Team help you with your real estate needs. Spring is here. The weather is getting warmer and days are lasting longer. Soon we’ll all be taking brisk walks, eating at sidewalk cafes, and spending more time in our backyards 🙂 We’re ending the first quarter of the year and getting ready for peak real estate season which typically runs from Spring into Summer. Rates are still fairly low and home prices are appreciating at a modest pace so overall the market feels very balanced as we head into April. Regarding home sales, they are down significantly once again. February marks the seventh consecutive month of year over year decreases in home sales. This is likely a result of the higher interest rates we were seeing last year which probably priced some buyers out of the market or made some buyers change their plans. We’ll see if this year’s lower interest rates lead to an increase in home sales or if that trend still continues. As for home prices, February marked another small increase (2%) in year over year home prices. January’s increase was 1.5% so this seems indicative of the stability that we’re seeing in the market. Just two years ago year over year home prices were all in the double digits, but in the last 12 months, we’ve seen five months of single digit increases. It will be interesting to see if this trend continues throughout the next quarter, or if we see a jump back to the double digit home price increases. And lastly, when it comes to Month’s supply, the market is still fairly balanced at 6.6 months. It has been hovering around 6-6.5 months for the last year or so and this is probably why we have seen a more balanced market within the last 12 months. Right now we are still getting good turnouts at our open houses, still receiving inquiries, and still generating offers. The market is still moving, and buyers are still out there, but we wouldn’t classify it as a “Hot Market” because demand just isn’t the same as it was 2-3 years ago. We’ll continue to watch the market and keep you posted 🙂 Curious what’s happening in your neighborhood? Request a free local market report today! Curious how these numbers affect you? Request a Local Market Report today. 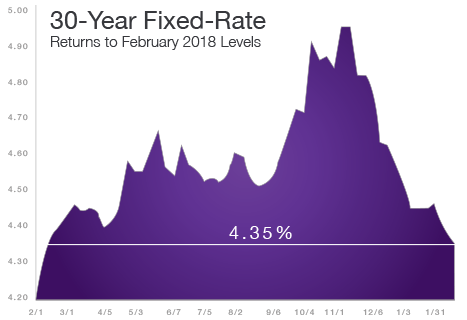 The 30-year fixed-rate mortgage averaged 4.35% during the week of February 28, remaining virtually unchanged from the prior week and the lowest since February 2018. 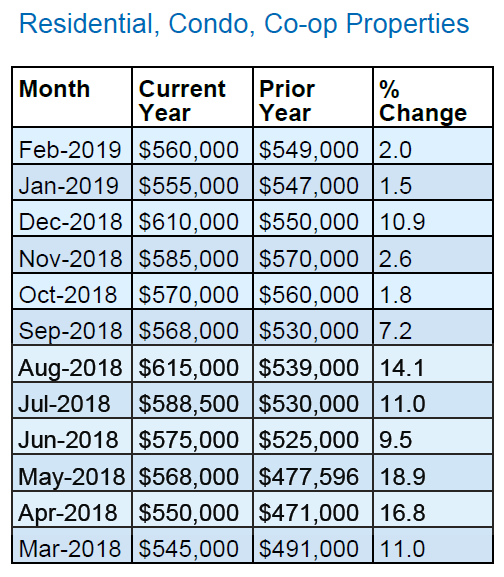 Despite the median listing price nationwide now 7% higher than a year ago at $295,000, the impact of rates coming back down (and potentially staying down for at least a little while longer) brings renewed hope for the housing market this spring in terms of demand for borrowers. The Long Island Board of Realtors reported a total of 531 home sales during the month of February. 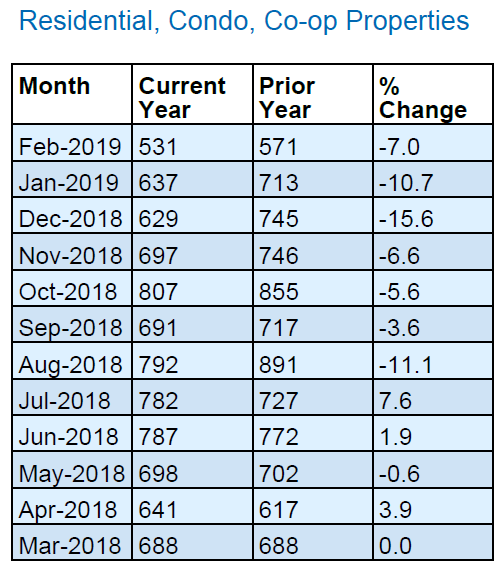 This was DOWN 16.7% from January and DOWN 7% compared to February of last year. When combined with On-line Residential (OLR) Sales, we are reporting a total of 562 home sales in February. Thinking of Selling in the next 6-12 Months? Schedule a Free Listing Consultation to find out how to best prepare for the sale. In February, the median home price in Queens was $560,000, this is UP .9% from January and UP 2% compared to February of last year. The median home price has increased by approximately $11,000 since last year. Thinking of Buying a Home in Queens? Speak with a local real estate expert who can help line up your financing, find the right place, and negotiate on your behalf. There is currently a 6.6-month supply of housing inventory in Queens, this is up from the 6.3-month supply we had last month, and up from the 5.2 month’s supply we had in March of last year. As for active listings for sale, currently there are 4,409 homes for sale in Queens. That’s DOWN 6% from February and UP 22% compared to March of last year. To put that into perspective, right now we have 4,409 homes for sale, and last year at this time we had a total of 3,613 homes on the market in Queens. This month our biggest aha came from a personal experience our team is having with the refinancing of a house. One of our team members is currently in the process of refinancing their home and one of the biggest learning lessons are the impact of something called CEMA. In short, New York City has a mortgage recording tax of 1.8% – 1.925% of the loan amount and given our high price points, you can already see how this can become a very significant fee to pay when you are refinancing. What we learned is that you can avoid paying the mortgage recording tax by getting a CEMA loan and although it is not always possible, it is definitely something you should be asking about when you are looking into refinancing. CEMA loans seem to pretty common and it’s a great way to make refinancing in NYC not only easier, but also more cost effective. Some important things to note are the fact that the timeline for your refinance may change because it will depend on how long it takes to get your CEMA approved. Our team members have been having a delay on their refi and the main reason why is because of this CEMA process. If you’re flexible with your timing, then it can totally be worth it though. *The opinions expressed in This Queens Real Estate Market Report are intended to supplement opinions on real estate expressed by local and national media, local Queens real estate agents and other expert sources. You should not treat any opinion expressed on this report as a specific inducement to make a particular investment or follow a particular strategy, but only as an expression of opinion. The Queens Home Team at Keller Williams Realty Landmark II does not guarantee and is not responsible for the accuracy or completeness of information, and provides said information without warranties of any kind. All information presented herein is intended and should be used for educational purposes only. Nothing herein should be construed as investment advice. You should always conduct your own research and due diligence and obtain professional advice before making any investment decision. All investments involve some degree of risk. The Queens Home Team will not be liable for any loss or damage caused by your reliance on information contained in this report.